Did you know Risotto is a cooking technique, not a dish? Think of it as an Italian way to cook a particular grain of rice, which is arborio, a short grain rice variety. Risotto by definition is made by cooking the rice in a pan with onion and olive oil. Then adding wine until it evaporates, then add hot stock little by little until you get the perfect grain of rice. Variations on the dish don’t stray from the risotto technique, they just use different ingredients. So if it’s an “oven cooked” risotto, it’s actually a pilaf by definition, which is a delicious dish as well. If you want to learn a true risotto technique follow this easy step by step instruction, enjoy, and have fun! I hope with this step by step many of you can make your own delicious risotto at home! It can be an intimidating kitchen feat, but so doable! So I am totally aware of my obsession with food, and how when I take a bite I am saying something out loud as to how good it or some version of a tasty food phrase. But I really just think it’s true, it is good. Most of the food that goes into my mouth is good. I don’t eat crappy food, nor do I eat super fancy food either, just on occasion in both cases. But it is rare that I taste something and don’t find the good in it. I suppose, and don’t take this the wrong way, I make most of the food I eat, and it is food I grew up eating, or fabulous recipes from other awesome food blogs, magazines, cookbooks, so it’s destiny is good from the start. This is not to say that I don’t screw up and burn food, over or under season, but for the most part, it is good food. And because of my love for food, and apparently my culinary skill (smile now), I get to make and eat good food, in my opinion, most of the time. This dish is one of the many things I eat, that I really, really enjoyed making and eating. Yup, another one of those… I hope you like it too. Risotto is one of those things you can make by following the instructions on the box or bag, or do it the Italian way. This is the Italian way, or so I was told. It is also a dish you season, as in salt and pepper, as you go. It builds depth of flavor (I totally just said that), so the risotto is not flat at the end. 1. Start by warming your stock in a saucepan, simmer, not boil. Keep it over low heat while making the risotto. Preheat oven to 350. 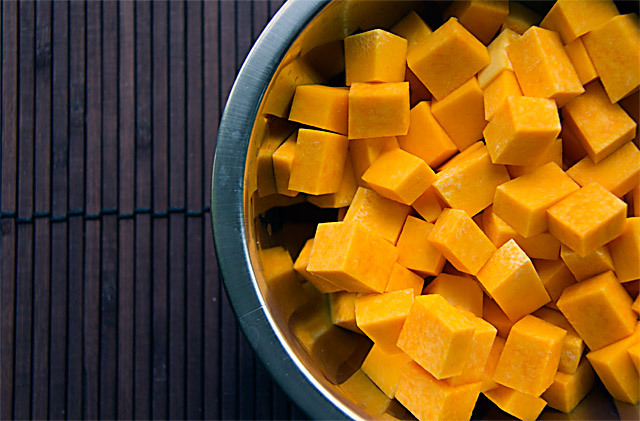 Place diced butternut squash on a roasting pan, drizzle with olive oil, and roast for 20 minutes while cooking rice. 2. In a large saute pan, add the oil over medium heat. 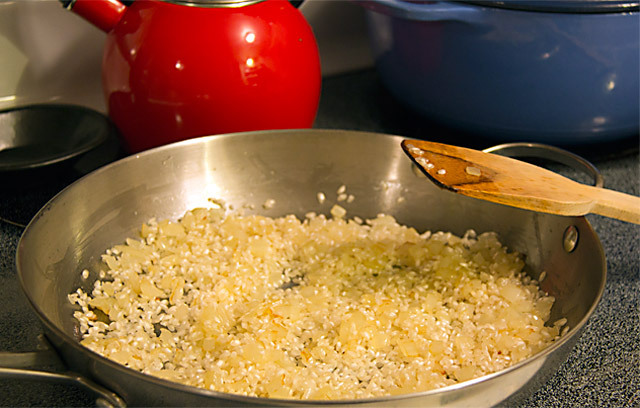 Once the oil is warmed, add the onion, and sweat (no color) for 10 minutes. Add the arborio rice and stir for about 2 minutes to coat the rice. Add the wine. Keep the heat at low medium for the whole process. 3. Once the wine has been almost all absorbed by the rice, add about 2 cups of stock. This is how we will be cooking the rice, little by little adding more stock until absorbed. Add a pinch of salt and pepper. Stir frequently. 4. Once that liquid is almost absorbed, add 2 more cups of stock. Absorbed, add 2 more cups, and a pinch of salt. Stir frequently. Absorbed? Add 2 more cups. Stir. 5. I used about 8-10 cups of stock. It just depends on the day how much liquid you will need. A well cooked arborio rice is tender but not mushy. Taste it: if it needs more stock, add 1 cup at a time, stir, absorb, add more if needed. 6. Final taste, check seasoning. Add salt and pepper to taste if needed. Keep heat low to finish. Stir in 1/4 cup parmigiano reggiano cheese. 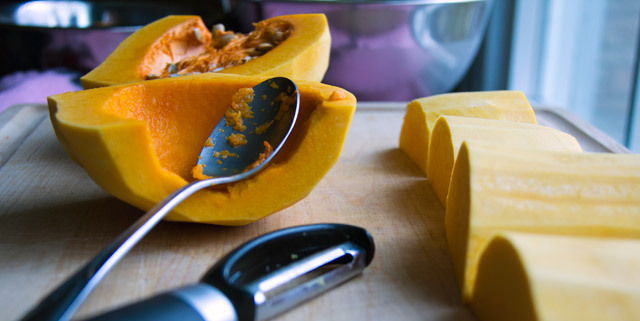 Remove squash for the oven. Take half of it and put it in a bowl, mash with potato masher, or a fork. until mostly smooth. 7. 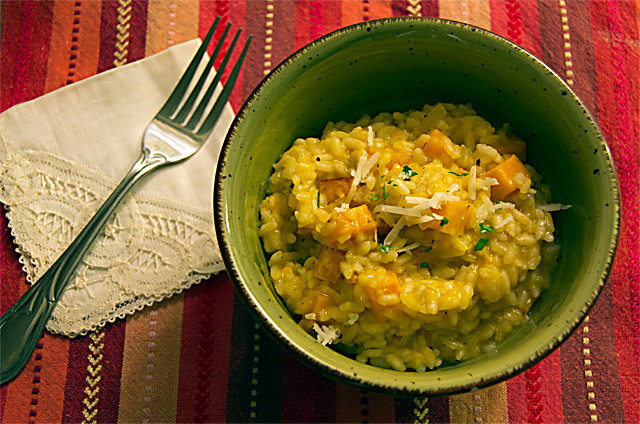 Take the puree and stir it into the risotto, then add the other half of the diced squash, stir, and serve with parm reg and fresh parsley. P.S. The next day leftovers… I sauteed asparagus with olive oil, salt and pepper for 6 minutes, and served it over my risotto. This entry made me giggle and had my mouth watering. The giggle because I’ve been witness to you, and am often guilty myself, of making yummy food noises. I can’t wait to try this! That is so funny! mmm… you so need to make this, you would love it!